Carrots are believed to be of middle Asian origin, probably evolving from a wild plant resembling Queen Anne's Lace. The first roots consumed were probably purple in color. The first orange types appeared in the Netherlands during the seventeenth century. Of all the root crops, carrots are the most important. It is the single major source of vitamin A in American diets. 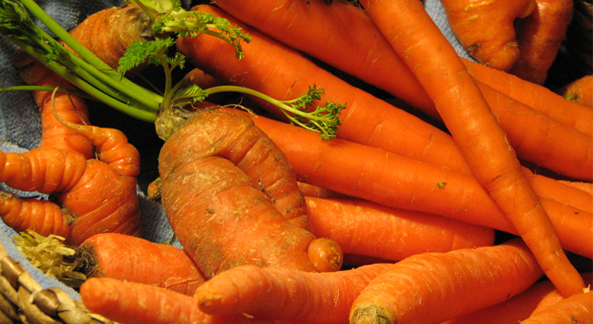 In addition to vitamins and minerals, raw carrots also provide important dietary fiber. Carrots are at their best when young and tender. Simmered in a little water, steamed, fried in butter or in a salad. Raw carrots make a pleasant and simple salad if coarsely grated and dressed with lemon juice. Because carrots are rather sweet, they have been used frequently in steamed puddings and cakes. Store carrots in a plastic bag in the refrigerator for two to four weeks.